Cast: Antonio Banderas, Eion Bailey, Alan Arkin, Jim Broadbent, Matt Day, Kyle Chandler, Michael McKean, Colm Feore, Alexa Davalos, Anthony Stewart Head and Pedro Armedariz, Jr. 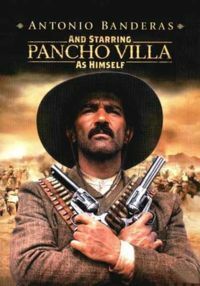 Forced to buy weapons on the black market by President Woodrow Wilson’s embargo, Pancho Villa (Antonio Banderas) sells exclusive rights to film his battles against Huerta to Mutual Studios. Eager but busy organizing the establishment of a studio in California, the studio’s leading director DW Griffith (Colm Feore) sends Frank Thayer (Eion Bailey), nephew of Harry Aitken (Jim Broadbent), the head of the studio, to El Paso to arrange a deal with Villa. Although the first attempt fails to produce usable footage, Thayer convinces his uncle to make a longer film, The Life of General Villa, and charge double the price. However, Wilson has lifted the embargo, so Villa declines the offer until newspaper baron William Randolph Hearst uses the execution of British rancher William Benton (Anthony Stewart Head) to stir up anger in the US against Villa. Realizing the need for favorable publicity, Villa agrees to only fight in the daytime and to consult with Mutual before each battle. Thayer arrives with a full film crew, including actress Teddy Sampson (Alexa Davalos), director William Christy Cabane (Michael McKean) and Raoul Walsh (Kyle Chandler), who will play Villa. Initially unwilling to believe that Villa had Benton killed, Thayer witnesses the ruthless side of Villa after the Battle of Torreon. Later, a disillusioned Thayer attends the movie’s successful premiere. 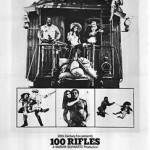 While the movie may seem the feverish idea of a screenwriter who is a fan of both early Hollywood and the Mexican Revolution, and tried to jam two unrelated scripts together, it is based on real events. 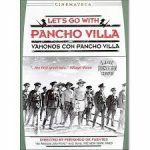 The contract for the second movie exists, and director Raoul Walsh has written about the experience of playing Pancho Villa. Since the actual film disappeared, there is considerable room for artistic license. Arriving in El Paso, Texas to negotiate the contract with Villa, Thayer joins a large group of Americans watching a battle on the other side of the river. 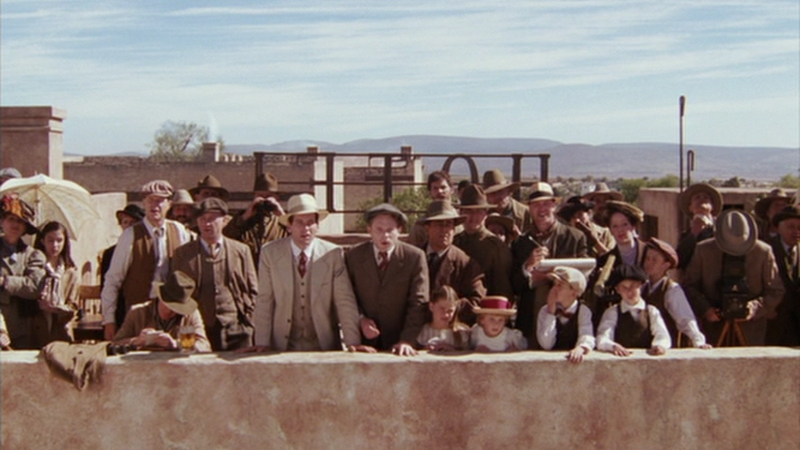 Strange as it may seem, Americans did gather to watch the struggle for Ciudad Juarez, across the river from El Paso. While it may appear foolhardy, it was actually quite safe since both Villa and Huerta had ordered their men to avoid firing anywhere near the American side of the border, in order to avoid giving the United States an excuse to intervene. Among the Americans is John Reed (Matt Day), an American journalist who had developed radical politics covering labor protests in New Jersey, and spent four months with Villa’s army in 1913, writing a series of articles for Metropolitan Magazine, although he would later become famous for his firsthand observations of the Bolshevik Revolution. Unfortunately, the actor gives a bland portrayal of Reed, who seems to exist simply to provide background for the viewer. 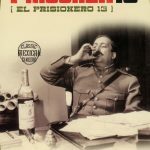 Admittedly, the film’s title makes it clear that the story will focus on Pancho Villa, but the script makes it seem that Villa is the only one fighting the revolution, rather than present the true scope of a national revolution. 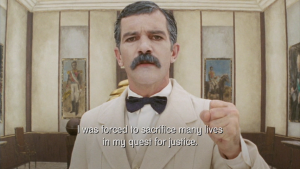 A brief scene shows President Huerta dismissing the threat of Villa, but fails to capture the hard nature of the real man, who had risen through the ranks due to his brutal efficiency in crushing rebellions before seizing power. The script neglects to even mention Venustiano Carranza, the self-proclaimed leader of the revolution, despite his feud with Villa and the fact that Carranza had handled the Benton matter with the British government. 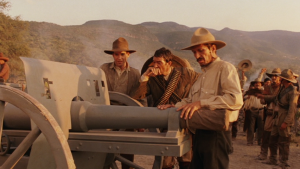 During the brief scene with Huerta, his aide worries about Villa’s new artillery, but Huerta is contemptuous, asking who will fire the artillery? The answer is Felipe Angeles, who is given a few seconds of screen time with the artillery, but the script does not explain that he was a general in the army before the revolution but was loyal to Francisco Madero, and would play a key role in the revolution. Nor does the script mention that Villa had worked with Huerta to put down a previous rebellion early in Madero’s regime until a disagreement had resulted in a nervous Villa standing in front of a firing squad. Honestly, a near-death experience seems like something Villa might have talked about. 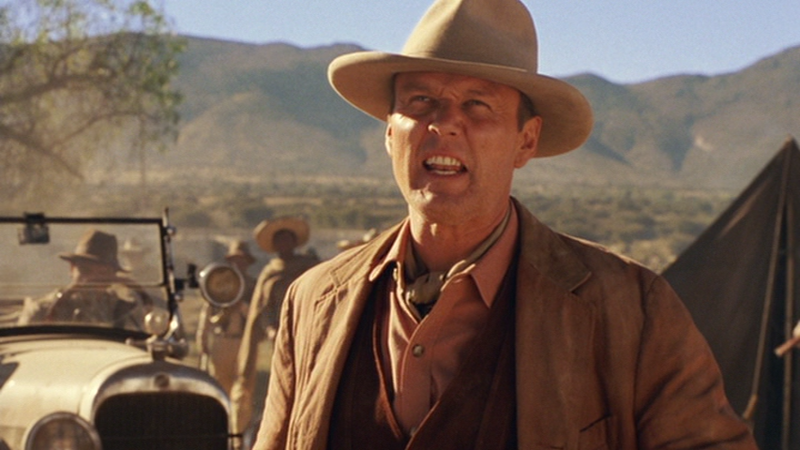 A pivotal event in the film is Villa’s decision to execute the extremely unpleasant rancher William Benton, who naively believes that his status as a British citizen enables him to treat a powerful rebel leader with contempt. Although the exact circumstances remain unclear, the real Villa did stir up a crisis when General Rodolfo Fierro, Villa’s executioner, shot William Benton, a British citizen and owner of a hacienda, who treated his workers harshly and refused to pay taxes to the rebels. Actually, the entire event was out of character for Villa, who strived to protect America-owned property, since he was aware that his supply of weapons depended on a good image in the United States. The British government was furious, especially since it had ceased its support of Huerta only after President Wilson had promised that the revolutionaries would respect foreign property. At a loss when dealing with foreign diplomats, Villa asked Carranza to handle the situation, failing to understand that he had publicly acknowledged Carranza as his superior. A master of polite delay, Carranza realized that Britain had more pressing European concerns, so he stalled until the situation blew over. Soooooo, why was there a weapons embargo? Pressured by large business interests in the United States to recognize Huerta’s regime after he overthrew Madero, President Woodrow Wilson had adopted a policy of “watchful waiting” that included neutrality in the growing civil war and an arms embargo on both Huerta and the rebels. Actually, Wilson was willing to lift the embargo but Carranza refused to permit American troops to enter Mexico to guard the borders and blockade the ports to ensure a fair election. An arms embargo sounded effective on paper but the border was too long and there were too many Americans who were willing to accept Villa’s money, which leads to the question, where did Villa acquire money? When Villa had fought at the beginning of the revolution, he had merely been one of Madero’s more effective military commanders, relying on Madero’s organization to obtain weapons and supplies. Following Madero’s execution, Villa lacked financial support. Aside from forcing the wealthy to give loans to the revolution, Villa targeted the haciendas, where he would kill the owner and the manager, and open the granaries to the peons. The strategy proved effective and recruits swelled his army. 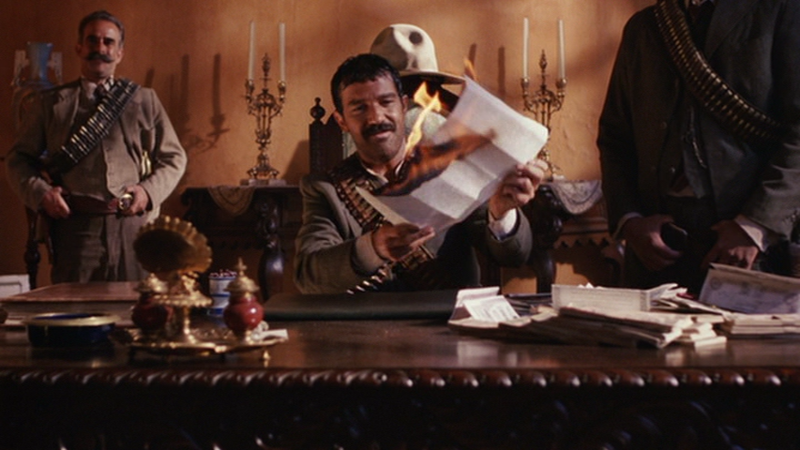 At one point, Villa occupies the hacienda of Luis Terrazas (Pedro Armendariz, Jr.), burns the deed in front of him and forces Terrazas to give all of his money to the revolution. Actually, the real Terrazas had already fled to the US. More important, the script does not explain that the Terrazas clan had dominated Villa’s home state of Chihuahua and had bankrolled Pasqual Orozco’s failed rebellion against Madero. I realize that there may not have been enough time to explore Terrazas’ full role in the revolution, but the script missed yet another opportunity to show the complexity of the revolution. 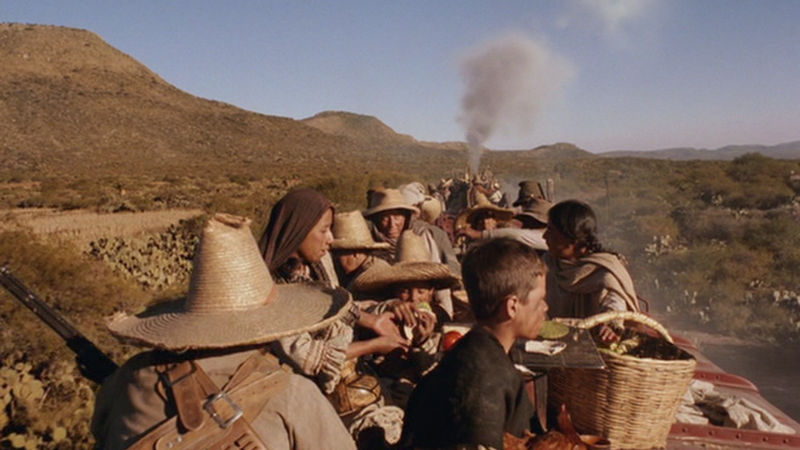 While the treatment of Terrazas was inaccurate, the scene was beautiful since it was filmed on a real hacienda. 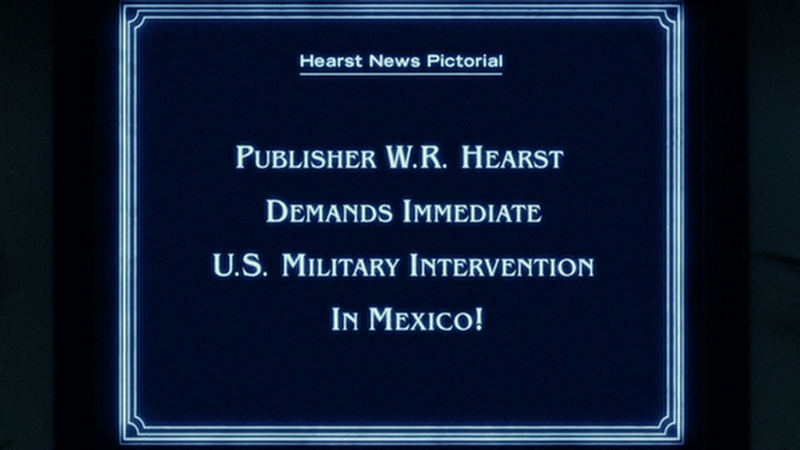 A key element of the plot is Thayer’s desire to use the film to oppose newspaper mogul William Randolph Hearst’s relentless campaign to stir up enough anger in the United States to force President Woodrow Wilson to intervene in the Mexican Revolution. 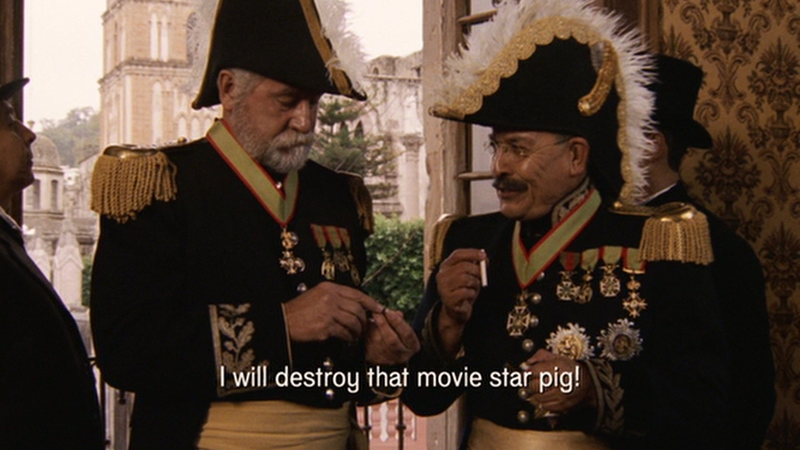 The idea that the film stopped a US intervention is unlikely, since the US would soon occupy Vera Cruz, when Wilson used a minor diplomatic squabble to attempt to force both sides to the negotiating table. 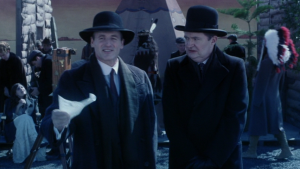 However, the movie may have blocked Hearst’s efforts to broaden the occupation into a full-fledged intervention, which might have led to the annexation of the northern states of Mexico, where he conveniently owned huge tracts of land. Wilson’s original goals had been unclear but the intervention proved extremely unpopular in the United States, despite the efforts of the Hearst press to whip up support for a war. Speaking for the oil industry, Senators Lodge of Massachusetts and Fall of New Mexico tried to persuade the Senate to vote for permitting the president to send troops to safeguard American people and property, but were defeated. 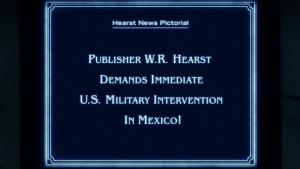 The screen Villa believes that Hearst’s newspapers attack him because Hearst owns millions of acres in Mexico, and he has rustled tens of thousands of his cattle. Hearst did own vast tracts of land in Mexico, and Villa was a bandit and rustler before he joined the revolution, but he was a small-time rustler, so tens of thousands of cattle is an exaggeration. A major exaggeration. The depiction of Villa is one of the movie’s strengths, although the screen Villa is toned down. In particular, his numerous forced marriages are not shown, instead he has a single lover. Like the fictional Villa, the real man handled everything himself, which would prove to be a key factor in his downfall. At the height of his power, Villa commanded an army of 50,000 soldiers that was fighting in several parts of Mexico, so it was impossible for him to lead it directly, but he was unwilling to delegate real authority. 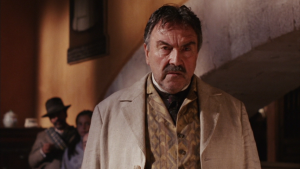 At one point, the screen Villa plays himself as a weary, old man, who has become president of Mexico, even though he had resisted the scene, claiming that he wants the right man to become president so he can retire. It is true that he did not want to be president but he did want to be the one who decided who was the right man. Alan Arkin plays Sam Dreben, a mercenary machine gunner, who pays himself by pulling out gold teeth from dead Huertistas. While the real Dreben was a larger-than-life character, who did fight with Villa’s army, the character receives nearly as much screen time as Villa. Which leads to my main criticism, namely screenwriter Larry Gelbart’s decision to focus equally on Pancho Villa and the Mutual Film Studio at the expense of a more in-depth examination of the revolution. 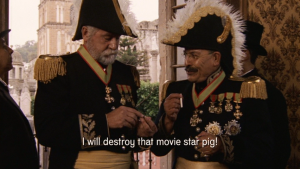 Since producer Joshua Maurer performed the initial research and then hired Gelbart to write the script, I suspect that he may have just kept the interesting parts about Villa to make a more coherent screenplay. The presentation of the film sets during the silent era is superb, especially the stiff acting and the shouted instructions by the director, while the contrast between the live acting and how the filmed scenes actually looked in black and white is amazing. I had not realized that a violin was played during filming to put the actors in the right mood. Filming battles directly became common in WWII, but it was revolutionary at the time. A fun scene where Raoul Walsh proves that he can ride and shoot in order to win permission to play Villa presents the revolutionary’s charming side. 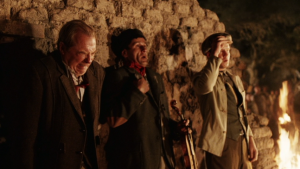 However, Villa’s volatile nature appears when he places director Cabane and the rest of the film crew in front of a firing squad as a prank when he learns that they will not participate in the battle of Torreon. Speaking of Cabane, Michael McKean is a delight as the director, whose constant impatience reflects the speed with which the early films were made. The film revolves around Villa, played by Antonio Banderas, who gives a superb performance. Actually, it was a risk to cast him, since he is Spanish, not Mexican, and the cast and crew were initially resentful, but he won them over. 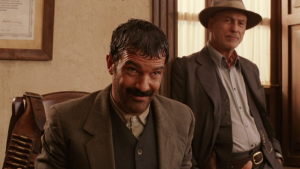 Determined to give an accurate portrayal of Pancho Villa, Banderas worked with a dialect coach to sound Mexican. The battles are a tribute to the limited production budget, the film does not look like a TV movie. Director Bruce Beresford carefully storyboarded the battle scenes to ensure that the second unit filmed what he wanted. The sets are gorgeous with amazing production detail, there is something happening in the background of each scene. Furthermore, the train in the movie was a real train. Larry Gelbart, the screenwriter, was the creator of the M*A*S*H television series, so he is quick to point out that Villa’s medical train/HQ was the first MASH unit. And Starring Pancho Villa As Himself is both a portrayal of Pancho Villa when he was at the height of his power and a loving tribute to the silent film era. 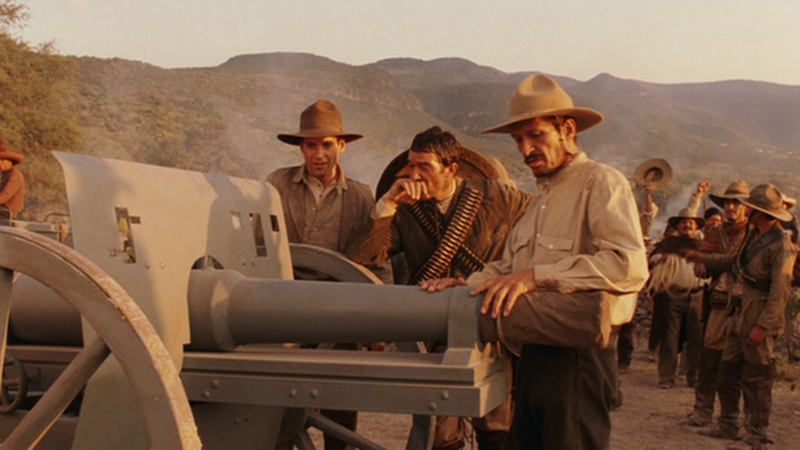 Despite my complaints that the script ignored any part of the revolution not directly related to Villa, it is still one of the best movies I have seen on the Mexican Revolution.